The most recent dividend increase was in December 2015, when the Board of Directors approved a 7.60% increase in the semi-annual dividend to 71 cents/share. The largest competitors for Disney include Time Warner (NYSE:TWX), Viacom (NYSE:VIA) and Twenty-First Century Fox (NASDAQ:FOXA). 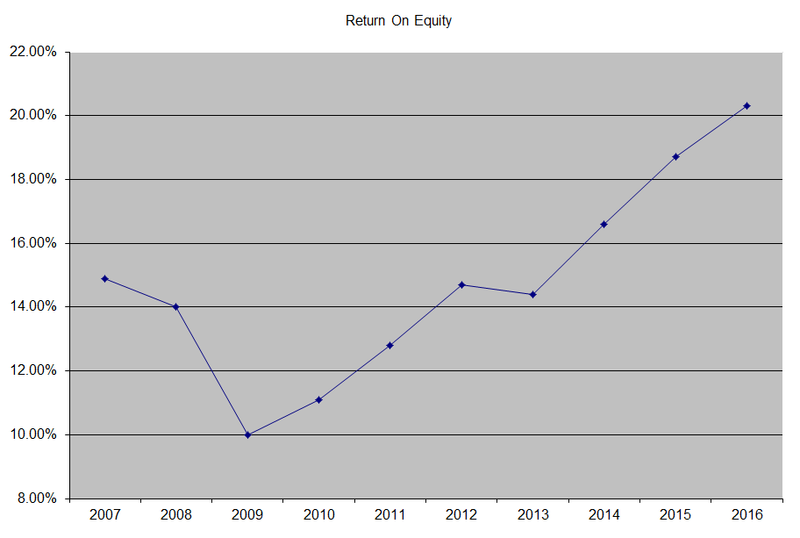 Over the past decade the stock has delivered an annualized total return of 13.20% to its shareholders. Future returns will be dependent on growth in earnings and dividend yields obtained by shareholders. The company has managed to deliver a 13.30% average increase in annual EPS over the past decade. Disney is expected to earn $5.96 per share in 2017 and $6.69 per share in 2018. In comparison, the company earned $5.73/share in 2016. Between 2006 and 2016 The Walt Disney Company has been able to reduce the number of shares from 2.076 billion to 1.639 billion through consistent share buybacks. The annual dividend payment has increased by 17.60% per year over the past decade, which is higher than the growth in EPS. 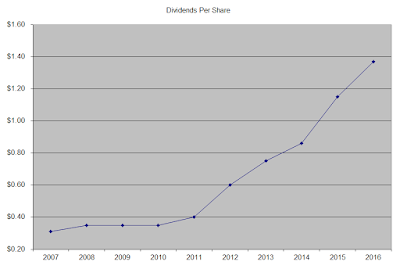 Given the low payout ratio, I expect annual dividend growth over the next decade to exceed earnings per share slightly. I believe that Disney has what it takes to achieve dividend growth over time though not every year. In the past decade, the dividend payout ratio increased slightly from 13.80% in 2007 to 23.90% in 2016. The company has a perennially low dividend payout ratio, as the rest of money is allocated to expand the media empire, and provide more dividends in the future. A lower payout is always a plus, since it leaves room for consistent dividend growth minimizing the impact of short-term fluctuations in earnings. 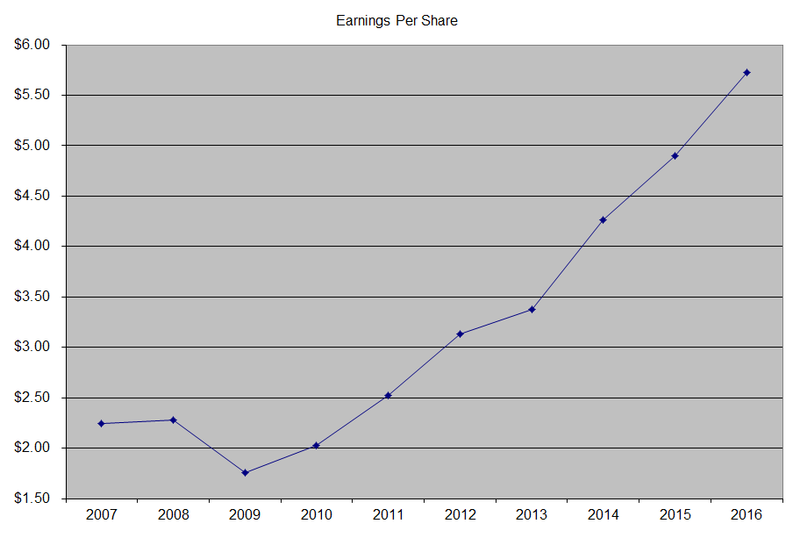 Currently, Disney is attractively valued at 17 times earnings. The company will probably turn off many investors because it has a low yield of 1.50% and pays dividends twice an year. However, I really like the company, and I believe it has a wide moat. I had hesitated initiating a position in the company in the past, because of irrelevant factors such as low yield, while ignoring the company's strong competitive position. I felt more comfortable initiating a position in the company at lower prices. I believe that this is an amazing business, that is available at an attractive price. It would be even more interesting if it were available at 15 – 16 times earnings.